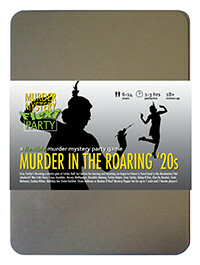 You've been invited to play the role of TOOTS MAHONEY in Murder in the Roaring '20s. Gray Catsby has invited his most talented and wealthy friends to a charity gala event at his countryside residence, Catsby Hall. But before any dancing and donations begin, Catsby’s fiancée, Ginger Whiskers, is found dead in the dumbwaiter! Join the flappers and dappers to find out who finished her off! As a fashion lover, you're happiest wearing daringly-cut dresses with a mock feather boa and a trilby hat to show you can be one of the boys too. I’m Toots, and I’m the Mahoney to Knuckles’ Baloney. Thank you all for taking us in after our car broke down today. I’m very sorry too for your loss. I was in the kitchen and the dining room around the time of the murder - I think the dumbwaiter runs between them doesn’t it? I hope that doesn’t make me a suspect!